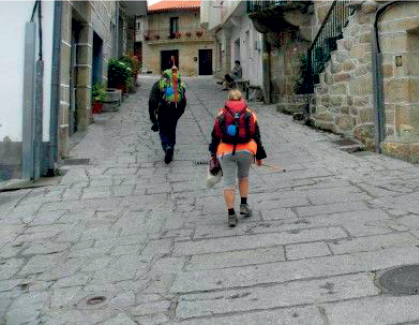 The presence of thermal waters, great relief for the walker's feet, together with its strategic situation, have made Ourense a landmark in the Way to Santiago since its inception. Today it is still a must stop on the Mozarabic Way, which is followed by the walkers from southern Spain. The Mozarabic Way is the longest Galician Jacobean Way: connecting Sevilla and Santiago de Compostela while extending an ancient Roman road that linked Merida with Astorga. This route was kept alive in the early Middle Ages, first by the Visigoths and then under Islamic rule (in fact the name Vía de la Plata comes from Arabic “bal’latta”). Mozarabic Christians re-christianized it in the late Middle Ages, when pilgrimages from Andalusia and Extremadura began. The pilgrim that follows the old Via de la Plata takes the detour in Granja de la Moreruela (Zamora) up to A Gudiña, where there are two routes for Santiago (one going across Laza and the other across Verin) leading to Ourense. From here there are 100 kilometres to Santiago, the minimum to get the Compostela certificate. 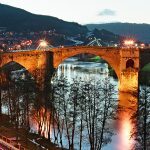 Why not to choose Ourense as the trailhead for the Jubilee? Pilgrim’s Credentials is the passport in which the various seals of the Way to Santiago are stamped. 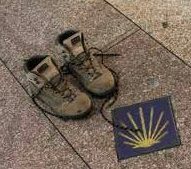 You need it in order to sleep in official hostels and to obtain the Compostela, the council document certifying the completion of the pilgrimage for religious or spiritual reasons. To get this certificate, you must prove at least 100 kilometres on foot or horseback or 200 by bicycle. You can buy the passport both at the Ourense Cathedral (+34 988 22 09 92) and the Association of Friends of the Way (+34 988 39 11 10). Please check opening hours. Finding this signal means that you are on track. A symbol of life and evocation of water, the scallop shell is the main icon for the pilgrim, and represents the convergence of the many European roads to Santiago. It is used to identify the path, but not the direction; for that, follow the yellow arrows that point it. In the province of Ourense you will also find many stones made by sculptor Carballo to guide yourself. Each one is different. Discover them. 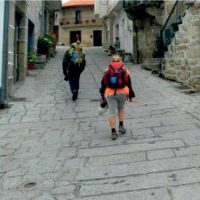 Ourense receives the pilgrims in the rural village of Seixalbo, a set of ethnographic value still retaining its medieval trace. From there, the Way enters the city from the south, going through Zamora Avenue and Progreso Street to As Burgas, the hot springs which every pilgrim must visit since the Middle Ages. A gentle climb leads to the new pilgrim hostel, just a few metres away from the Main Square, from where you can see St. Martin’s Cathedral, a transitional Romanesque temple in which you should visit the Chapel of the Holy Christ and the polychrome Gate of Paradise. 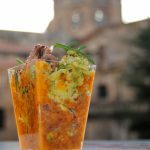 In the nearby streets, the Os Viños winery area is ideal for discovering the best of the local cuisine in the form of tapas and snacks. 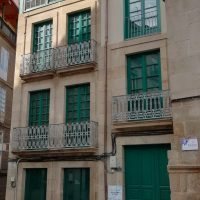 From Los Suaves Square you can go to spend the night at the official pilgrims hostel, located in the San Francisco Monumental Area: a previous Gothic convent, only its Gothic cloister and a cemetery remain. The Way continues to the Roman Bridge, the oldest bridge of the city. After crossing it, there are three alternatives. The Eastern detour leads us from Santiago Avenue to the ancient Royal Way, where we will find the village of Cudeiro. The Northern detour follows instead the N-120 road to the hill of Canedo. 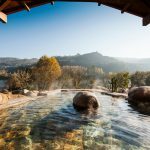 There is a Western detour running through River Minho’s thermal route, a green corridor spotted with five thermal zones in which to take a bath, and connecting with the Northern detour in Quintela. 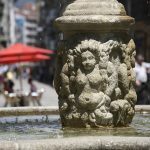 In 2018, Xacobeo’s new official pilgrim hostel opened on Barreira Street, next to As Burgas fountains: the thermal springs whose waters have been a gift for pilgrims and travelers for centuries. 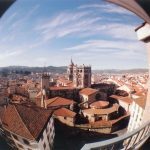 Ourense is the first big city after many kilometres of Camino, so pilgrims have the possibility to choose an alternative accommodation: hotels and hostels in which to rest, but also to enjoy the lively urban environment and the peace of the hot springs. Official hostel for the Way to Santiago, located next to the hot springs of As Burgas. 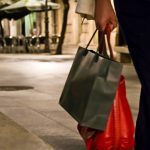 Ideas, recommendations and clues to make your journey a perfect experience.